Realty Income (O) is a real estate investment trust, which invests in commercial properties. The REIT owned 5,172 properties at the end of 2017, most of which were single-tenant ones. Realty Income has a weighted average remaining lease term (excluding rights to extend a lease at the option of the tenant) of approximately 9.50 years. These are triple-net leases, where the tenant pays everything from taxes to maintenance on the property, while the landlord like Realty Income collects rent that escalates over time. It is a pretty sweet deal, provided that you can purchase great locations at attractive valuations. Realty Income is a dividend achiever which has raised dividends for 24 years in a row. The REIT has a strong track record of paying dividends monthly, and raising them several times per year. It is the Golden Standard of Triple Net Leases. The company usually raises its monthly dividends every quarter by a little bit, which amounts to a respectable year-over-year raise. The latest raise was just last week, as the monthly distribution was boosted to 21.95 cents/share ( or $2.628/share annualized). 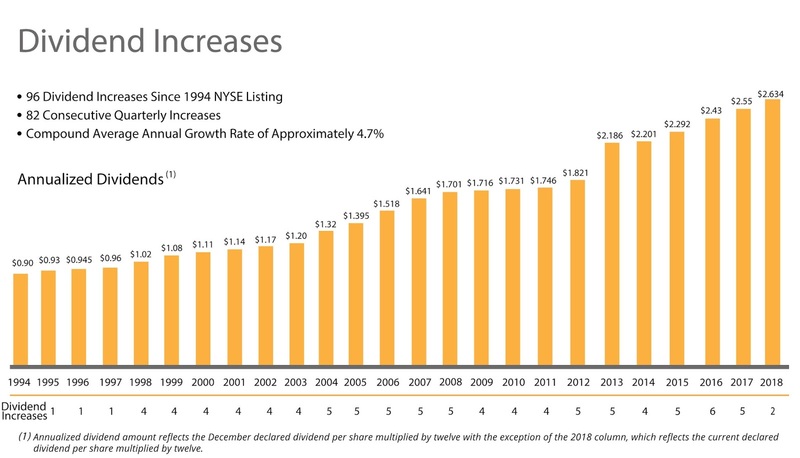 This was the 96th dividend increase since Realty Income's listing on the NYSE in 1994. The new dividend is 4% higher than the dividend paid during the same time last year. Over the past decade, Realty Income has managed to boost annual dividends by 4.40%/year. Coupled with high current yields, this has translated into respectable total returns to shareholders over time. The largest tenants for Realty Income are listed below. Most retailers today are widely believed to be doomed today, and Amazon is supposed to be the one and only retailer of choice in the future. The future will be tough on retail. However, people will still shop online and in physical locations. Looking at the list of 20 largest tenants, I think that we have a low risk for the majority of these locations losing out to Amazon. I wanted to note that approximately 80% of rental revenues are derived from retailers. There is a risk that retail is going down the drain, which would result in bankruptcies and vacancies for landlords. Depending on your beliefs, real estate investment trusts are either bargains today or they are value traps which are destined for mediocrity. Rather than fall for broad generalization, I decided to look at top tenants Realty Income, in order to determine the degree to which the business is subject to destruction from online. I also believe that while many retailers will have a harder time earning profits, the landlords that own the real estate have some margin of safety due to the long-term lease contracts. In addition, those landlords could always sell or repurpose those locations. Realty Income does point out that 90% of retail rent is leased to tenants with low price point, non-discretionary and/or service-oriented component to their business. These are retailers that may have higher survival rates. Historical tenant bankruptcies have been in industries that Realty Income has minimal exposure to today ( casual dining, sporting goods and grocery). Another factor I like in analyzing REITs is to review trends in portfolio occupancy. As you can see below, Realty Income has managed to enjoy a high occupancy in the 97% - 98% range over the past decade. The worst financial crisis since the Great Depression resulted in a decrease in portfolio occupancy to a low of 96.60%. This is not bad at all. Below, you can see trends in Funds from Operations (FFO), Dividends Per Share (DPS) and FFO Payouts over the past decade for Realty Income (O). The company issued 2018 AFFO per share guidance of $3.14 to $3.20, representing annual growth of approximately 3% to 5%. Realty income has managed to grow dividends per share throughout the Great Recession. This was supported by growth in FFO/share. As a result, the FFO Payout is around the same as it was a decade ago. As a REIT, Realty Income distributes most of its free cash flow to shareholders in the form of dividends. As a result, it grows by relying on capital markets for investment capital. It has relied more so on equity than debt in the past, as is evidenced by its conservative capital structure with 73% equity and 27% debt. Since the company has long term leases, this limits annual volatility in rent. Annual same-store rent growth run rate of ~1.0%/year over the past decade. The Cap Rate that Realty Income has managed to get on new capital invested has declined by 7.90% to 6.60% since 2010. The rising competition for properties has definitely pushed profits lower. However, this is higher than the weighted cost of debt at 3.80% that Realty Income pays to creditors. Most of that debt is with a fixed rate, which is good if interest rates rise. As interest rates have been declining over the past 24 years that Realty Income has been publicly traded, this has been a strong tailwind for performance. Unfortunately, that debt needs to be rolled over every so often, which leaves the company exposed to the vagaries of credit markets, particularly if they freeze or interest rates are higher when Realty Income needs to tap capital markets for funding. The other factor to keep in mind is that so far, the dividend yield on Realty Income has been lower than the yield that could be generated by renting out properties to tenants. If investor sentiment turns sour towards REITs, further growth may be limited when dividend yields on the types of Realty Income exceed rental yields on triple-net-properties. Rising interest rates could translate into lower demand for REIT dividends by investors, which would lead to decline in share prices and rising dividend yields. This would be a headwind for future growth. Of course, if cost of capital increases, it is very likely that demand for properties declines, which will push cap rates higher to compensate for the lack of demand (or lower demand). Since Realty Income is of high quality, and it has a large scale of operations, its cost of capital is lower than competitors. This is a competitive advantage that could lead to better access to deals and potentially better opportunities relative to competitors. The risk of potentially higher interest rates would make many projects more expensive. Higher interest rates will reduce FFO and cash available to pay dividends to shareholders. The contra-argument to the rising interest rates thesis has been that rising rates are an indication of increased economic activity, which should bode well for landlords. The other contra-argument is that most of the REITs below have staggered maturities, and are mostly capitalized by equity rather than debt. The third contra-argument is that existing debt is already taken at low fixed interest rates. Rising interest rates should affect debt refinancing and profitability spread for new properties. Of course, everyone has been expecting rising interest rates for almost a decade now. Noone can predict the future. Today, Realty income is selling for 16.70 times FFO and yields 5.20%. I would be interested in buying more Realty Income as long as it yields more than 5%. This is equivalent to a price below $52.60/share. If an investor purchases shares at a 5% starting yield, and the company grows distributions at a rate of 4%/year, this investor can double their income in eight years if they reinvest dividends ( assuming yields stay at 5%). This means that a $1,000 investment today, with dividends reinvested, could deliver $100 in annual dividend income around 2026 - 2027.